Our 100% owned Imperial Project is located in Imperial County, California within 10 miles of existing operations. With 200,000 feet of historic drilling, Imperial is an historic feasibility and NI43-101 PEA* stage gold oxide opportunity ready for advancement. The project is well studied and bears low technical risk. Imperial is a large, near surface, low-grade, oxide heap leach (4 pits: West, East, Singer (2) pits) with low water, air, environmental and biological impact. Being far-removed from communities and subsided in local topography, the impact on viewscapes is limited to the immediate project area. Kore’s mine and reclamation plan addresses current Federal, State and County regulations and meets California reclamation requirements, including backfilling of metallic mines. Accordingly, the Company expects to promptly advance the Imperial project through permitting and toward production. 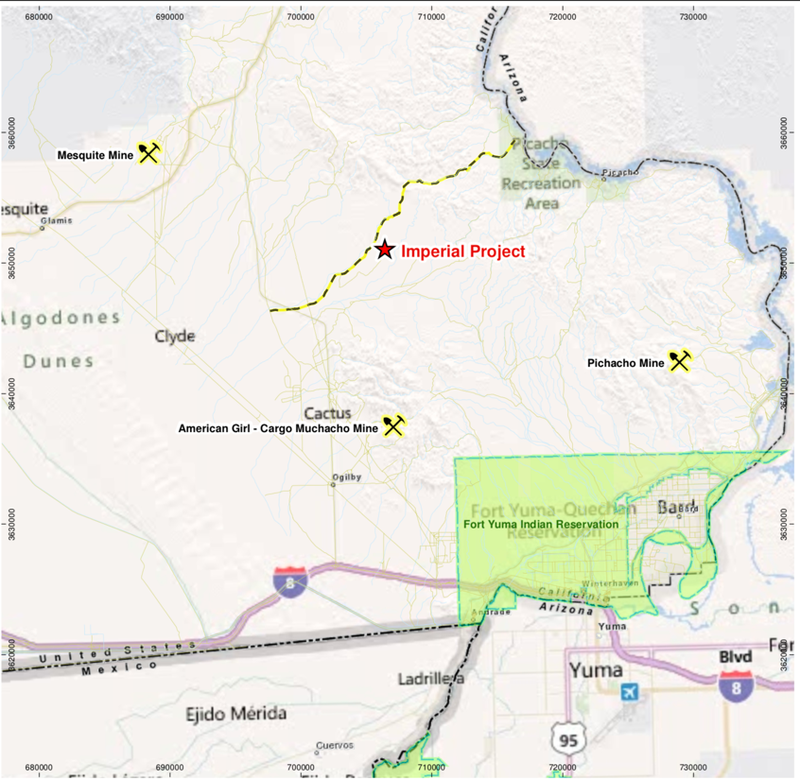 The Imperial Project consists of 656 claims covering 5,721 acres and is located in Imperial County in the desert region of southeastern California, USA. It is located along the Indian Pass Road approximately 26 road-miles northwest of the city of Yuma, Arizona, and is approximately 45 miles east-north-east of El Centro, California. The project is located on public land administered by the Bureau of Land Management (“BLM”). The operating Mesquite Mine and the closed Picacho Mine are located roughly 10 miles to the west and east, respectively, of the property. The closed American Girl Mine is about 8 miles south of the project. The project site is completely undeveloped with the exception of the Indian Pass Road, which travels through a corner of the site. Surface facilities (offices, shop warehouse, etc.) and infrastructure (electrical power and water supply) are proposed to support the mining and leaching operation. Road, one production water well and power line (161kV) exists on site. The mining rate for the project is proposed to average 32.9 million tons per year with more than 329 million total tons of material mined over a 10 year mine life. The project is proposed to treat 25,000 tons per day (“t/d”) of mineralized HL material. The overall strip ratio (the ratio of waste rock to economic mineralized rock) of the mine is 2.7:1 and the average grade of HL material is estimated to be 0.016 ounce of gold per ton (“oz/t”) (0.54g/t). Mining will be a 24/7 operation utilizing ten (10) 240 ton haulage trucks. The pits are designed with 40 foot mining benches. A 14.8 million sqft leach pad with a capacity of 150 million tons of material has been designed to ensure adequate space for all historic reserves within the project boundary. The project was explored by Gold Fields Mining Corp., Glamis and its predecessor companies primarily through drilling between 1987 and 1996. Drilling was comprised of mainly of reverse circulation and some core drilling. A total of 349 reverse circulation (“RC”) drill holes totalling approximately 195,060 ft, and nine core holes totaling approximately 4,900 ft, were drilled. 1980: Goldfields Mining Corp. began regional-scale exploration in search of heap-leachable deposits similar to their discovery at Mesquite. 1981-1985: Exploration concentrated on the Imperial area based on anomalous drainage geochemistry, geophysical signatures, and outcropping mineralization at the Singer and Anna M prospects. 1986: Exploratory drilling intersected mineralization at the East and West areas (e.g. K-77 27.4 m at 1.12 g/t Au). 1987: Imperial County JV formed between Goldfields, Glamis Gold, and Amir Mines Inc.
1987-1992: Deposit was expanded through continued RC drilling. By 1992, 169 RC holes totalling 21,805 m were drilled. 1994: Glamis Gold acquired 100% of the property. 1994-1996: Resource development drilling was initiated. A total of 29,147 m in 127 holes were completed. Metallurgical testing, engineering, environmental, and archeological studies were also completed. 1996: A feasibility study was completed in April, 1996. 1996-2000: An environmental impact report/study was published by Glamis Gold. 2012: Project optioned to Delta Gold. An historic NI 43-101 compliant preliminary economic assessment report was completed in October, 2012**. The accompanying resource estimate was based on 349 holes totalling 59,450 metres. The economic study stated a pre-tax net present value (NPV5) of US$215 million (US$1,300/oz Au) while projecting average production of 120,000 ounces of gold per year over a mine life of 10 years. This PEA contemplated a secondary crush (minus 2 inches) to improve recoveries to 83% on crushed leach feed. 2013: The optioned project was returned to Goldcorp Inc. (then owner of the project) in a recessionary gold price environment in 2013. 2017: Kore Mining Ltd. acquires 100% of the Imperial project from Goldcorp Inc. The Company expects to update the economic study on this project in 2019 in accordance with its permitting timetable. The project area is underlain by a sequence of Jurassic age gneisses and schists. The overlaying stratigraphy is made up of fanglomerates and alluvium that vary in thickness from 10 to 700 feet (“ft”) and cover 95% of the project area. Gold mineralization occurs primarily within hematitic and limonitic altered breccias, microfractures, and gouge zones developed in the host biotite gneiss and sericite gneiss units. Minor quartz veining, very-fine grained pyrite pseudomorphs and silicified zones are also common. · Internally, Kore has re-constructed geological and mineral resource models from existing data. · Kore review of drill logs and RC chips affirmed the regularity of the deposit due to fault hosted mineralization. · The geological setting of mineralization is responsible for the near-ideal leach characteristics of the deposit. · A permeable fault zone provided a channel way for mineralizing epithermal solutions. · Gold is deposited on surfaces of fault-breccia clasts. · The fault zone remained permeable to groundwater resulting in complete oxidation of mineralization. · Clast sizes within the fault are optimal for producing permeability in heaps. · Clasts are relatively unaltered by hydrothermal and weathering events. · The position of mineralization in the rock sequence is very consistent throughout the deposit. · The mineralized zone is at or just below the upper fault plane that separates Jurassic volcanics from Cretaceous gneiss. · Some mineralization penetrated the upper plate (hanging wall of the fault). · The zone between pits is structurally complex due to post-mineral faulting. However, the mineralized zone continues between the pits. The project boasts an historic oxide-only Proven & Probable Reserve of 89,567 Ktons @ 0.017 opt for 1,486,000 oz Au***. In 2012 an updated historic NI43-101** on the Imperial project was prepared, as shown below. The most recently prepared historic resource in 2012 was completed by SRK and considers that resource blocks located within a conceptual pit envelope show “reasonable prospects for economic extraction”. Historic mineral resources are reported at a cut-off grade (“COG”) of 0.005 oz/t and include all resource blocks above cut-off inside the conceptual pit shell. The Company’s current program is focused upon permitting the Imperial project. Our team comprises accomplished industry leaders with demonstrated success in advancing projects through California-regulatory processes. We consider the Imperial project to be technically and economically viable, ecologically sustainable and socially equitable. The Company intends to use modern exploration and mining methods designed to protect the environment and to study environmentally responsible alternatives at all stages of project development. Benefits to the community will be multifold including increased jobs, rise in community-based spending and overall economic stimulation. Mining benefits also lead to increased government support for schools, hospitals and infrastructure. Our project proposal has sought extensive public consultation and the project plan addresses these local issues where feasible. The Company also intends to update economic analysis in the form of a pre-feasibility study in 2019. Illustrative Profile of West and East Pits. A longitudinal slice through the Imperial deposit illustrates the main features of the geological interpretation used to constrain the current resource block model. The pit shell, drill holes and position of the mineralized zone are approximations for illustration purposes only. A continuous mineralized zone is segmented by a series of northeast oriented, post-mineral faults. Some holes in the drill hole array were noted to end in mineralization. These holes were not used to define the lower or footwall surface of the mineralized zone. Note the sparse drilling between the two pits and the holes drilled in this area ended in mineralization. Mining is typically a high paying and equal opportunity industry. We believe Kore is perfectly suited to a diverse community that is familiar with unemployment and limited development opportunities. We believe in a balanced approach to cultural, environmental protection with economic development. The Imperial project is in the right environment and we are permitting at the right time. The historic feasibility of this project has been demonstrated through the preparation of a joint EIR/EIS, which found that there were no significant environmental issues that could not be mitigated. Fully validated BLM claims give secure title and right to permit. All required permitting processes have been historically completed … the BLM may issue a ROD once adequacy of a(n updated) Final EIS is assessed. Kore intends to leverage the extensive historic work and existing Environmental Impact Report/Study. Kore is in process of updating technical, environmental, biological and cultural studies to meet modern mining regulation and practices. In April 2017, the Trump administration developed a “priority work” list for the BLM to streamline the permitting process for hard rock mining (and other activities). In an August 31, 2017 secretarial order, the DOI “streamlined” agencies’ processes for analyzing environmental impacts. Now, agencies may not spend greater than one (1) year to complete an EIS, nor may their final report be more than 150 pages, or 300 pages for “unusually complex” projects. * All estimates described above were prepared prior to 2000 and are presented herein merely as an item of historical interest with respect to the Imperial Project. There were a number of mineral resource estimates and associated mineral reserve calculations prepared on behalf of Glamis by the outside consulting group, Western States, during the period 1995 to 1998. It is believed that these estimates were not prepared in full compliance with the provisions included in National Instrument 43-101, as they do not clearly differentiate between Measured, Indicated, and Inferred categories of mineralization. Accordingly these estimates should not be relied upon. The Company has not done sufficient work to classify these historical estimates as current mineral resources or mineral reserves, and Kore is not treating these historical estimates as current mineral resources or mineral reserves. ** Imperial Project: Preliminary Economic Assessment Technical Report October 26, 2012 by Gordon Doerksen, P.Eng. Lois Boxill, P.Eng. et al of SRK Consulting (Canada) Inc. Prepared for ADR Capital Corp., Vancouver, BC. (“2012 PEA”), and PEA economic model. *** Western States Engineering Final Feasibility Study, April 1996. Prepared for Chemgold, Inc.
~ The reader is cautioned that the above referenced “Historical Resource” is considered historical in nature and as such is based on prior data and reports prepared by previous property owners. The work necessary to verify the classification of this mineral resource estimate has not been completed and the resource estimate, therefore, cannot be treated as NI 43-101 current resource verified by a Qualified Person. There can be no assurance that any of the historical resources, in whole or in part, will ever become economically viable. The historical mineral resources in this news release were estimated using the Canadian Institute of Mining, Metallurgy and Petroleum (CIM), CIM Standards on Mineral Resources and Reserves, Definitions and Guidelines prepared by the CIM Standing Committee on Reserve Definitions and adopted by CIM Council. Imperial Mineral Historical Resource Estimation Parameters: a) Grade estimation is based on assay samples composited to 20ft intervals. Grade capping thresholds were determined following a detailed statistical analysis of the data for the entire mineralized domains varied from 0.02 to 0.2 ounces per ton (opt) gold (Au). b) Resource model grade blocks were estimated using Gemcom GEMSTM modeling software based on a traditional wireframe interpretation constructed from a sectional interpretation of drilling data. c) The database for the Imperial model consisted of 349 RC holes totalling 190,134 feet of drilling. A total of 36,361 analyses were considered for use in the resource estimate. d) The modelled gold mineralized zone was subdivided into three domains displaying different strike or dip directions with a total length of 3,200 ft, width up to 800ft and average thickness of 85ft in the East area and 1,200ft in length, 1,000ft in width and average thickness of 90ft to 120ft in the West area, dipping from 5 to 35 degrees e) A bulk density value of 0.077 ton per cubic foot was used and derived from 9 core holes consisting of 32 samples collected in a 1994 and 1995 drilling program.